I smiled when I read this. Before John posted anything on this list he not only read the Immortal, but poured through all 500+ of my postings from the web site. Every hundred or so postings he read he wrote me some of his comments and questions. I noticed that the thing that bothered him the most was that he could find nothing to disagree with. Finally he found something, but I wrote back pointing out that we did not disagree after all. He felt justifiably disturbed at reading through so much and agreeing all the time, but such is the world of the soul. When two or more tap in to it they become one in seeing how the principles play out. One may like red and the other yellow as their favorite color but they will see eye to eye as far as principles are understood. 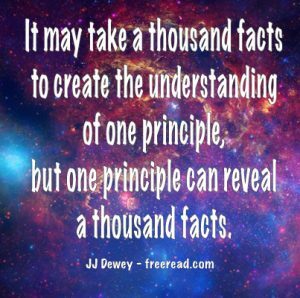 I know there are others like John that look towards principles rather than facts and in principles reflected from the soul within there lies oneness – the key to the next great step forward. I wouldn’t call His example in this light as good or bad. He merely did what was necessary to accomplish His mission. Part of His mission involved the demonstration of the resurrection after a definite public execution. If he would have been killed in the desert and raised again no one would have been impressed. But where He was crucified publicly for all to see then the coming back to life was quite impressive. To create a public execution He had to become a threat to the authorities and get under their skin. To accomplish this all He had to do was go forward and be himself. He spoke openly about his thoughts without holding back even though they infuriated the religious leaders. If you think I cause conflict you ought to read Matthew, chapter twenty-three. I am milk toast compared to the way Jesus attacked the authorities. He accomplished miracles that they could not even dream of, a thing which caused them to feel humiliated because they were supposed to be the spiritual ones that God was working through. He taught powerful doctrines, which if accepted would seem to destroy their religion. Jesus did all these things in the energy of the spirit without regard to offending people or not and sure enough it was not long before they plotted to destroy Him. Now we have a different mission than Jesus, and for most of us, it would not help us to accomplish our goals to incite the authorities to wrath. To be wise in avoiding the release of soul energy to the wrong people does not mean that you have to limit the flow that comes through you. In our business, for example, my wife and I deal with regular people all the time. By regular people I mean those who do not have any higher interest in the mysteries of being beyond typical church teachings or the next football game. We are friends with many of our repeat customers and I’m sure many would be surprised and alarmed to find out that I am the author of a book such as the Immortal and teach on a discussion group such as this. When I deal with these people I do not see myself as out of the soul, but I try to adjust to their consciousness and talk with them on their level. The funny thing is that many of these people who currently think I am a great guy would think I was possessed of a devil if they knew everything I have written and believe. Then there are times that I get a certain feeling about someone and do speak the words of the soul to him. I generally find I am quite accurate when I follow my instincts here. Let me just give you a short example. Several years ago when I was in real estate a young man came to see me about investing for himself and several friends. He told me that other realtors would not give him attention because he was so young and wondered if I would help him. There was something about this fellow that told me that there was a connection between us and that he was highly talented. He left that interview with a feeling that he was supposed to help me do something and was prepared to give me all his material goods if needed. I won’t tell you the whole story but the guy is now in a high position with a major corporation. The time is not yet right for me to call him into service but I believe the day will come that the inner voice will send me to him again. He will, of course, have the free will to gather with us or not, but I believe he is being prepared for some important mission of assistance. To sum up this answer then I will say that soul energy will not be diminished by being selective with whom you share energy. The main thing that will diminish your contact is to not follow the highest that you know. That highest that an individual ego knows may lead one to crucifixion, but another to praise, honor and glory. I will repeat that the crucial mission of the lights in this age is to live, build and teach rather than to be sacrificed to lions. Many of them have been through so much pain in past lives of service that they are having difficulty in adjusting to this new paradigm of the new age. Those who sacrificed in Pisces are to reap the reward with interest in Aquarius, but we must be prepared to receive. While I consider myself as “a reader,” student & of your “words & works,” I seemed to have “missed” or overlooked the Principle of “Oneness thru (Spiritual) Principles” & now see that & how this is what & how the primary purpose, intent & motivation has been (or might be) behind my use in/when applying the “spiritual principles” — as taught here — in my everyday life.